What if some of the most famous online services were launched in 1959? 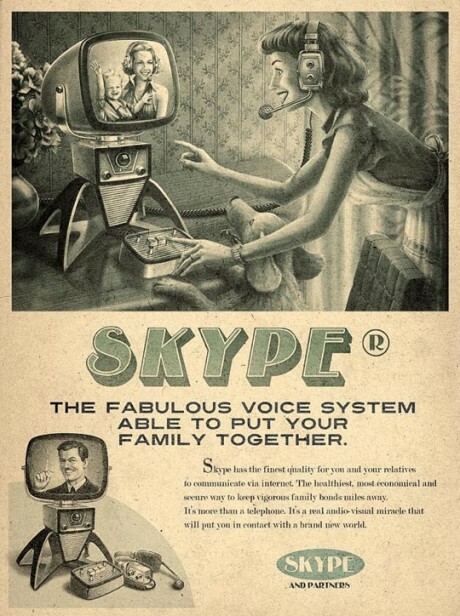 That’s what Sao Paulo ad agency Moma imagined when the released this 3 part series of fake vintage ads for Facebook, YouTube and Skype. The "Everything Ages Fast" ad campaign is Mad Menera imagery that would look perfect in vintage copies of Esquire…more below! 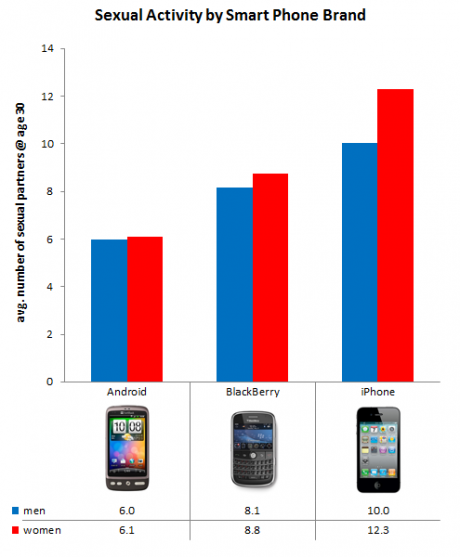 The chart pretty much speaks for itself; I’ll just say that the numbers for all three brands are for 30 year-olds, so it’s not a matter of older, more experienced people preferring one phone to another. We found this data as part of our general camera-efficacy analysis: we crossed all kinds of user behaviors with the camera models and found we had data on the number of sexual partners for 9,785 people with smart phones. We dropped what we found into Excel, and voila. This is part of a larger article where OKCupid did a statistical analysis of photo ratings they captured through their site. The best part — 11.4 million opinions on what makes a great photo. When fishing you use the lure, line and hook type appropriate to what you want to catch–a fisher would never use the same type of line and hook when trying to catch several different types of fish. Yet every day I see companies using the same general lures and hooks trying to catch many different kinds of fish. Ok, I’ve only ever been fishing once, but I hope the analogy will help as you read on. As a consultant, one of the biggest frustrations I face looking through RFPs and project descriptions is that while on the surface many look great, they ultimately don’t provide enough detail in terms of what’s needed. From experience this leads to frustration on both sides, as (i) the client gets bombarded with replies, a lot of which miss the mark in terms of skills needed, and (ii) consultants mistakenly apply for projects their skills aren’t best matched for. So why does this happen? Whether you’re a small/medium sized business or a multinational looking for an online project to be done, in the end it is usually one person who writes, or at the very least submits the project description. Especially in a larger organization, this person may not be closest or have the technical knowledge needed to accurately describe the skills needed/nature of the project. Even if they have the knowledge, there is the terminology trap–while I’m sure we can agree there’s not much alternate interpretation to, “experience conceptualizing and creating Twitter pages surrounding launch of new product”, “Social Media Expert” can be interpreted as general or granular, all-encompassing or exclusive–and is! …on a person-to-person basis. Others include: change in the scope of the project after an ad is posted, reposting of old ads with slight modifications, generalizing ads after a lack of initial response, and the list goes on. I recognize that sometimes there are some things that you can’t change. Let’s talk about those that you can. What can I do to help get the right consultant(s) for a project? If you’re looking for someone who is a “Social Media Expert”, define what that means to you. If you’re looking for a “SilverStripe Specialist”, list what specific skills you are looking for (e.g. are you looking to integrate an eCommerce solution into the site, and if yes, what one?) The same applies to skills. If you want someone who is experienced in WordPress 3.0, then don’t write “experience with WordPress”, or even worse, “experienced with CMSs”. Avoid using words like expert by themselves–they are too ambiguous and as a result too open to interpretation (e.g. a self-proclaimed flash “expert” might be of a high enough level in their own or even previous clients’minds, but not enough to make your cut–if you give examples you’ll be able to weed out more unqualified individuals before having to ask them questions in an interview/presentation). Also, if you’re posting on someone’s behalf, backtrack and make sure that any overly general terms are fleshed out. And if that isn’t an option, put yourself in the consultants’ shoes and try looking through some RFPs online–you’ll quickly see the difference between those which are specific enough and those that aren’t. Clarifying is particularly true in terms of technical specifications–if you’re a marketing person and your RFP includes detailed specifications from someone, it’s probably a good idea to leave them as they are–they’re like that for a reason. As with #1 specificity is key, but only listing in detail what you need is not enough. “What do you mean the site doesn’t have [feature alpha-beta-squiggly mark]? We thought it was standard.” or “What do you mean we won’t be able to make the original deadline? The number of revisions shouldn’t matter.” When I first started consulting, if I was given a nickel for every time I heard some variation of these I’d be writing this article from my private yacht instead of at the offi…er I’d be a man with many, many nickels. While there may be certain universally accepted “standards” in terms of websites, this kind of assumption is very likely to leave you disappointed, and will lead to either scope creep or something simply not being done, not to mention the creation friction with your consultant and a lot of unnecessary back-and-forth. “copy for web and meta tags” means “complete SEO services including a social media campaign and Adwords”, and the list goes on. While at the end of the day there is going to be a certain degree of unwritten give-and-take in any project, clearly outlining expectations as much as possible from the beginning will help keep projects on time and on budget, as well as reduce time spent on dreaded five-email-deep back-and-forth threads. Appreciating that any organization is trying to get the most value for its money I’m not suggesting you throw out some wildly high figure–if you advertise that you’ll pay $200~$250/hour for a project then I guarantee you’ll end up having everyone under the sun that has even some of the skills and experience reply–especially if you’re too general in your description (see #1 above). If you’re on a budget it’s better for both yourself and prospective consultants to be up front with it. Doing so will save you headaches for two reasons: (i) consultants that have the skills but would balk once they hear the budget won’t apply in the first place, which means (ii) you won’t need to spend unnecessary time and human resources interviewing people who are ultimately going to turn down your offer. Tagging on to #1 and 2 above, it is also good to be as specific as possible. If you are looking for an ongoing or maintenance agreement and have budgetary expectations, now is the time to make them clear. If you have set requirements for payment scheduling I’d include those in here too. What this all really comes down to is at the end of the day you’re going to get what you pay for. Rome wasn’t built in a day on a dollar, and neither was Facebook. If you’re looking to build a BMW Convertible and you’re budget is a third of that, you’re probably going to have to settle for a Fiesta. This includes site maintenance. While it will vary from project to project, expect to add an additional 30% to your budget specifically for that purpose. And as an additional plus, if you’re honest upfront, you’re more likely to get someone who’ll settle for less if the opportunity is right–you still won’t get a BMW, but you very might well get a Focus. Nobody likes scope creep. As equally frustrating is having to push back deadlines. As a consultant do it once and it’s bad enough, do it more than once and your credibility takes a beating–regardless of the circumstances that led to it. Upon taking on a project a consultant agrees to the milestones and associated dates noted in the RFP. In terms of project management standard pessimistic-realistic-optimistic scenarios are created, and the project commences. Even the most drawn out timelines however, can fall victim to internal factors that can delay progression, or even worse, stop it altogether. If you have a drop-dead deadline for a project of six months from commencement, be sure that that deadline reflects what is realistic internally. If you know that your internal Project Manager/key contact is going to be away on business for two out of the six months, or is so busy they can only reply to critical emails once a week at most, perhaps six months isn’t realistic. Even the best PMs and consultants can only manage expectations, stay on clients and follow-up to a point–at the end of the day if your internal management and communication is poor it will ultimately delay the project, which can mean missed deadlines. This not only speaks poorly of the consultant, but ultimately of internal resources as well. Also let’s not forget about timeline based on what you are looking for. Let’s assume that you need what you want (assessing whether this is true will need to be another post)–do you know how a consultant is going to help you get there? I’ve seen projects falter because clients ultimately didn’t really know what they were looking for. An excellent article on that can be found here (I hope that clients and consultants alike can see the humor in it). Dealing with management and timelines can be challenging, but if you consider your internal resources and incorporate their management into your RFP, you will ultimately help the consultant, which in turn will help you. So now you have your polished, air-tight RFP ready for the world. Where should you post it? Given the law of large numbers if you put it on every major site out there you’re bound to find some quality–however is it really worth the thousand reply emails you’ll need to go through to get there? Start small with those sites/mailing lists/contacts that best indicate the specific individual(s) you’re looking for. If you don’t have any luck you can always widen your net later–trying to do it the other way around will not be as effective. And as with the specifications, if you’re not the only contributor to the RFPs content or not sure what are the best sites or lists to place it, do your research internally instead of taking a stab in the dark. With a busy schedule I appreciate that it takes extra work to write in the extra detail, but in the long run you’ll find it means less resumes and proposals to look through, or at the very least, a greater pool of eligibles that have the skills and experience you’re looking for. Happy fishing!